A report in the Times of India states that in Delhi anyone over the age of 21 can serve drinks at bar and restaurants in the state due to new legislation, but they still cannot legally drink until they turn 25! I am not saying that the validity of this ludicrous law has any real-world implications, but it is amusing when you consider the fact that in India, anyone 18 or older can vote. In addition, women and men can get legally married at the ages of 18 and 21, respectively. To read more about my thoughts on this ludicrous law check out my blog post on this topic. 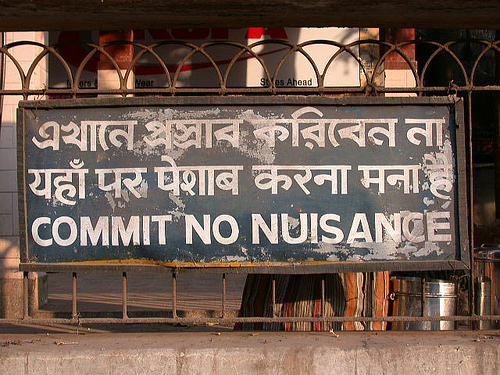 Ever wonder where the “commit no nuisance” phrase and sign come from? Utpal Datta stole the show in the Bengali film, Bikele bhorer phul. Here are a couple of memorable teasers for purposes of review. Both clips are under one minute and courtesy of Angel Video. If you like these clips, I encourage you to buy the original VCD from them. In the first, Utpal Datta gets emotional while reciting the poem he wrote, Khokon amar jadumoni. Robi Ghosh had a short, but memorable cameo appearance in the 1968 Parthapratim Choudhury directed film, Hansamithun. In this short scene, Robi explains the difference between mime and being an actual mute to a rustic friend from Contai. Contai, Contai, Contai. Tui na ekhon ekta gaainya roye geli! Kothay Contai aar kothay Paris?